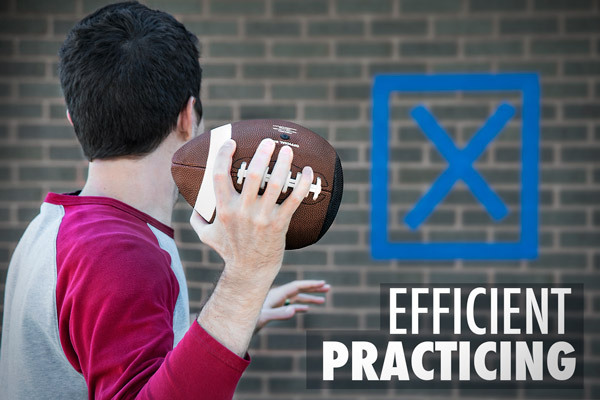 Practice smarter with the PassBack Training Football. 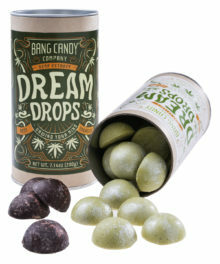 Its unique design allows you to throw it against a wall and it will bounce right back to you! 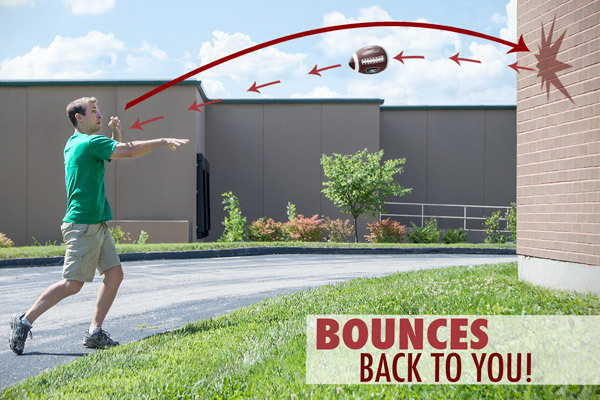 By flattening one end of the ball, the PassBack helps to simultaneously improve your throwing and catching skills. Because a wobbly throw won't bounce back straight, quarterbacks are encouraged to develop a tight spiral. Receivers will love working on their hand-eye coordination whenever the urge strikes. Groups can also team up and practice coming out of routes with quick reaction drills. PassBack is made from high-quality composite materials and is available in two sizes. Please note: The logo on the Passback Football has changed slightly since this video was made. The PassBack Training Football is pretty darned clever. 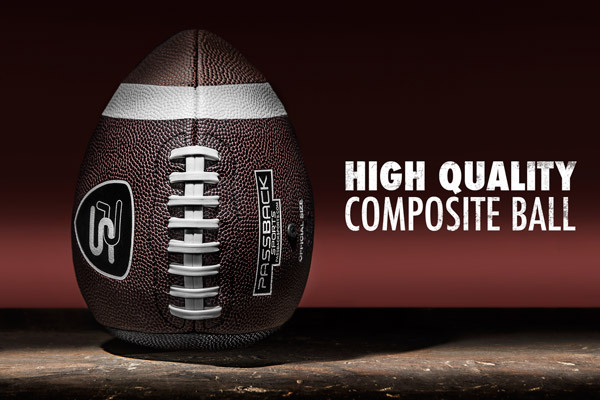 By essentially chopping off one end of a traditional football, the inventors have created a football that allows you to play catch on your own. 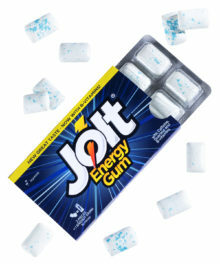 The "catch" (get it?) is that unless you throw a tight spiral, the ball won't bounce back to you. 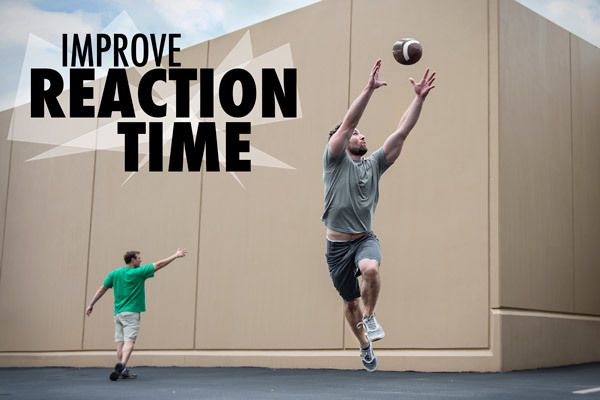 This feedback loop helps improve a quarterback's strength and accuracy. 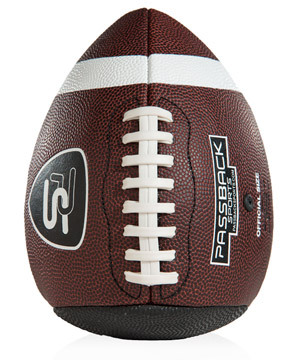 The nearly-flat bottom of the PassBack allows the football to bounce back to you. Because the PassBack will only bounce true if it's thrown with a tight spiral, your throwing will improve quickly. Simply put, having to chase down errant throws will serve as potent motivation. Additionally, you can use PassBack as often as you want; all you need is a wall! Only a well-thrown ball will bounce back to you. QBs and wideouts alike can benefit from PassBack. Here's an idea for a drill: position the receiver with his back to the wall. When he hears the ball smack the wall, he turns to catch it. This simulates coming out of a route and having to find the ball quickly. 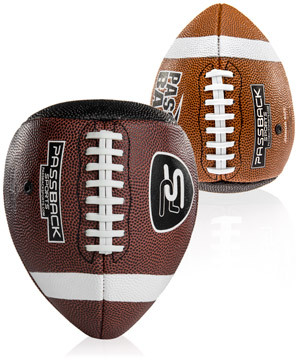 PassBack Training Footballs can help receivers improve their reaction time. 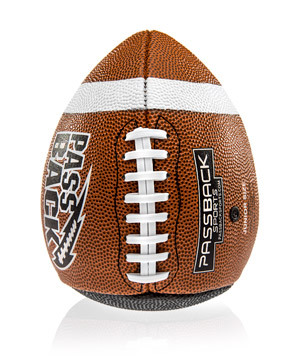 The PassBack makes practicing throwing and catching a football a ton of fun — either alone or with friends. And because it's made from high quality composite materials, it can withstand the beatings that come with being thrown against walls and bouncing on blacktop. PassBack is made from high-quality composite. It can withstand a lifetime of being thrown against concrete walls. 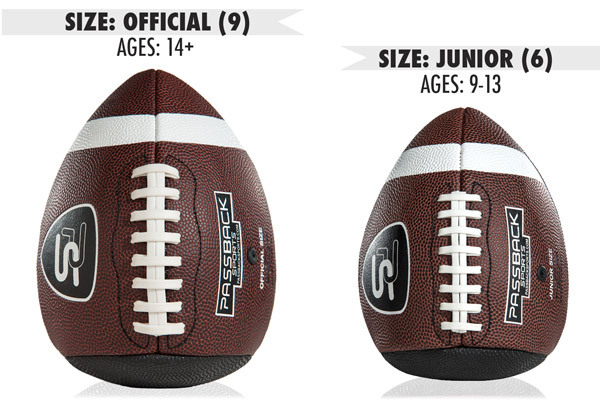 The PassBack Training Football is currently available in two sizes: Official and Junior. 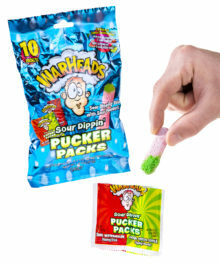 We recommend the Official size for ages 14+; Junior, ages 9-13. 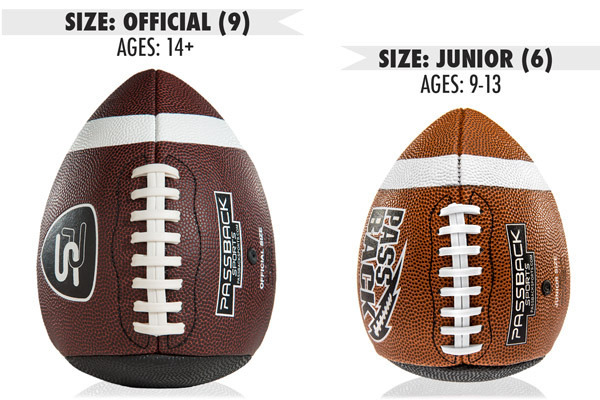 PassBack Footballs are available in two sizes. 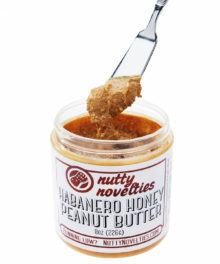 Question: Can it be used indoors? 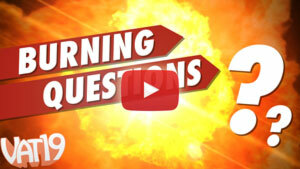 Answer: We don't recommend it, honestly. We tested it a bit on some of our interior office space and while it didn't leave any scuff marks, you really risk damaging your valuables with a bad toss. Question: What type of walls do you recommend? Answer: Any relatively flat exterior wall should work quite well. We've used it on brick, concrete, and even siding!